The Pepperdine Graziadio Business School spring 2019 commencement ceremony will take place at Firestone Fieldhouse on the Malibu campus on Saturday, April 13, at 10:30 AM. Stasia Washington (MBA ’13) will be recognized as the Distinguished Alumnus. Washington is a senior vice president and managing director with First Foundation, a financial services company. Washington creates customized wealth growth and enhancement plans for high-net worth individuals and also helps endowments, nonprofit foundations, and exempt organizations with asset management and strategies to reach their financial goals. 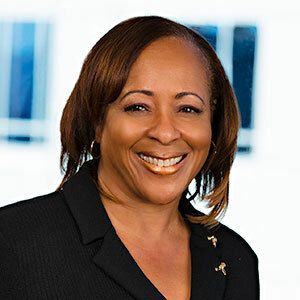 With more than 25 years of experience in the financial services industry, Washington has received many honors, including the National STEM Top Woman of Color in Finance Award and the Outstanding Banker of the Year Award from the Los Angeles Urban Bankers. She is also a founding member of the Motion Picture Television Fund Professional Advisory Council, the Council of Urban Professionals—West Coast, and the Pepperdine University Center for Women’s Leadership. Currently she serves as a member of the Graziadio Business School Board. Washington earned a master of business administration degree from Pepperdine Graziadio School of Business and is a graduate of the Executive Leadership Institute of the University of California, Los Angeles Anderson Business School. For additional information, visit the Graziadio Business School Graduation website.